Prepare a large baking sheet with parchment paper and add the chopped carrots and green beans. Drizzle with 1 tsp avocado oil and season with a pinch of Himalayan sea salt. Set aside. In a small bowl, mix the maple syrup, Tamari lite, 1 TBS of avocado oil, and garlic powder. Place both the vegetables and fish in the preheated oven and bake uncovered for 20 minutes. The fish should be easily flaked with a fork and the vegetables should be fork tender while retaining a bit of crunch. 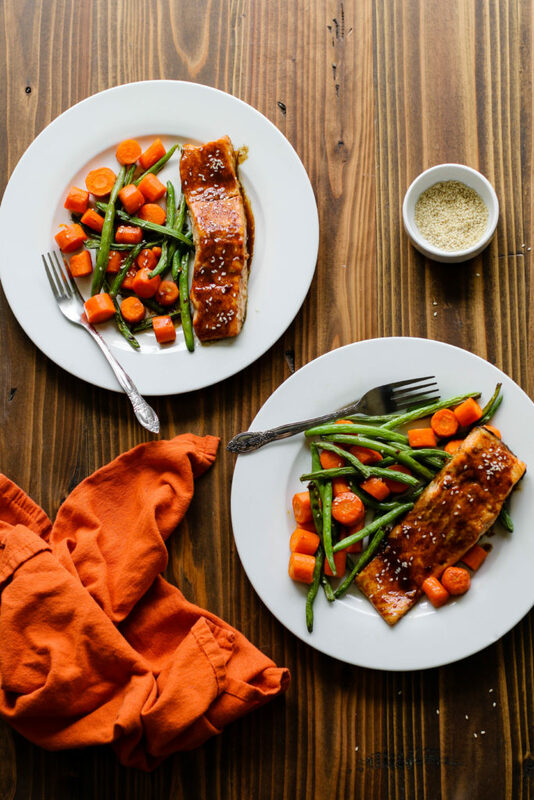 To serve, divide the veggies and salmon between two plates and brush on any marinade left from the pan. Sprinkle with sesame for garnish and serve immediately.